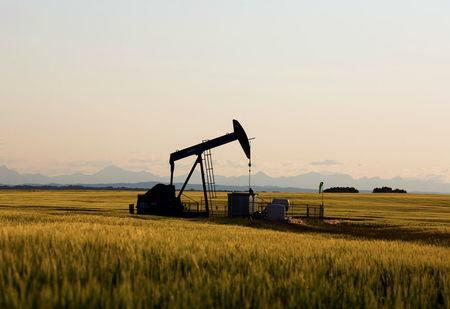 CALGARY, Alberta (Reuters) - The Canadian oil-producing province of Alberta will increase crude production limits by 25,000 barrels per day in May and a further 25,000 bpd in June, the government said on Monday. The increases mean that by June, oil companies will be limited to 3.71 million bpd of production. Alberta mandated production cuts this year to ease congestion on export pipelines that resulted in crude getting bottlenecked in storage and the discount on Canadian heavy crude widening to record levels. "This temporary policy has been critical to reducing the oil price differential while we move ahead with our medium-term plan to ship more oil by rail and lead the long-term charge for new pipelines as we fight to get full value for the resources owned by all Albertans,” Premier Rachel Notley said in a statement. The government said the increase in production limits comes as warmer weather reduces the amount of diluent needed to help oil sands bitumen flow through pipelines, increasing capacity. Diluent is any ultra-light hydrocarbon mixed with viscous bitumen to enable it to flow. The government said giving production limits two months in advance gives the energy industry and markets greater certainty when making decisions. Some producers like MEG Energy supported curtailments because the move boosted prices, but it was criticized by integrated producers including Suncor Energy and Imperial Oil whose refining operations were benefiting from cheap crude. Critics also blasted the government for making crude by rail shipments uneconomic and adding to volatility in the Canadian crude market. On Friday, Imperial canceled a $2.6 billion oil sands project in northern Alberta, blaming the uncertainty caused by government intervention in the market. Alberta is leasing 4,400 rail cars to ship 120,000 bpd of crude out of the province and ease pipeline congestion, with the first shipments due to begin in July. The latest production limit increase comes the same day Alberta opened its final legislature session before a provincial election that polls suggest will see Notley's left-leaning government cede power to the United Conservative Party. Why Kandi Technologies JV Captured Didi Chuxing, World's Largest Ride-Hailing Program, Through A Strategic Partnership To Initially Provide Up To 300,000 Government Accredited EVs For Didi's 31 Million Drivers.